Studio Fenton is a new grouping of very limited glass creations, made by noted Designers in the field of Art Glass. An announcement was made in July 2011 from Fenton Art Glass that they are shutting down production of traditional glassware, which includes the collectible items and home decor and figurines. As items sell out on our website, we will remove them for ordering. Art Glass Collectors worldwide appreciate the Cameo Artistry of Kelsey Murphy and Robert Bomkamp. 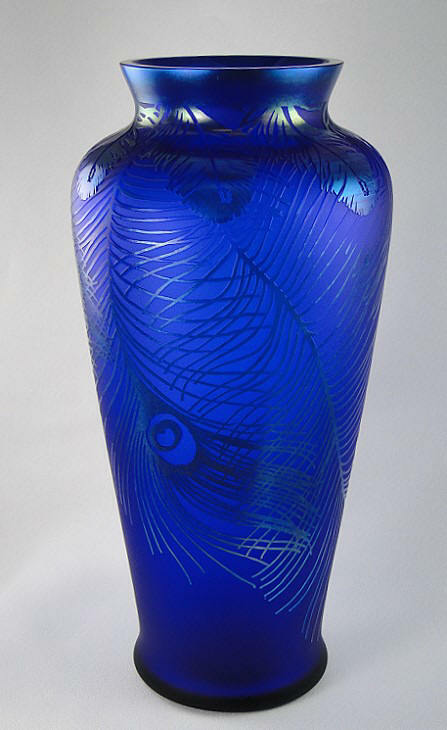 In this outstanding vase, they have collaborated with Fenton Master Glass Artisan Dave Fetty to create a dramatic piece of art glass. 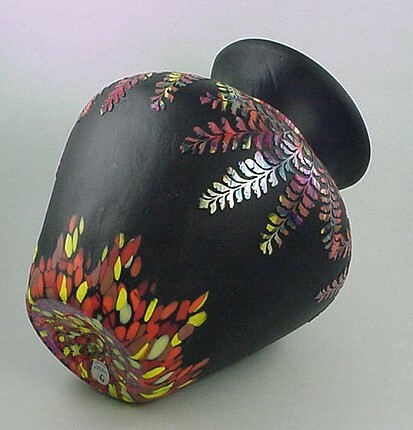 Each vase will be different and unique in coloration. Mosaic glass begins with black glass gathered on a blowpipe, and then a special technique is used to apply frit (bits of colored glass) to the piece before it is blown in a mould. 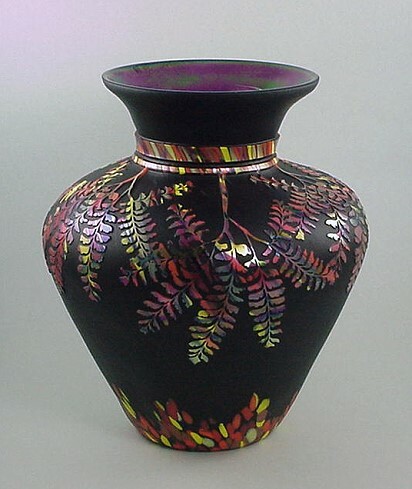 Murphy & Bomkamp have sand-carved the design into the vase, and the remaining black has a matte satin finish applied. 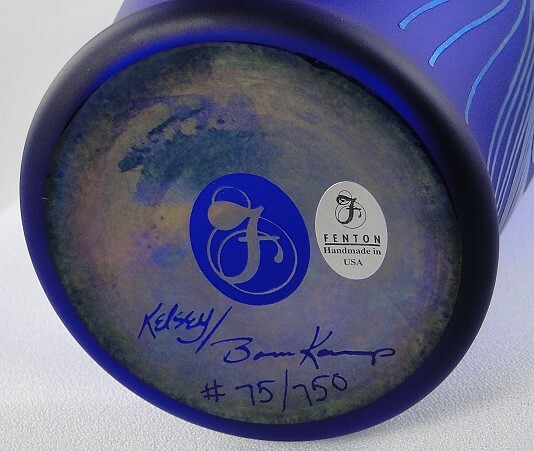 The vase is embossed with Dave Fetty's stamp and is inscribed with the signatures of Kelsey Murphy & Robert Bomkamp. Each vase is hand numbered on the bottom. We have one vase available --- it is #48. It is pictured above. 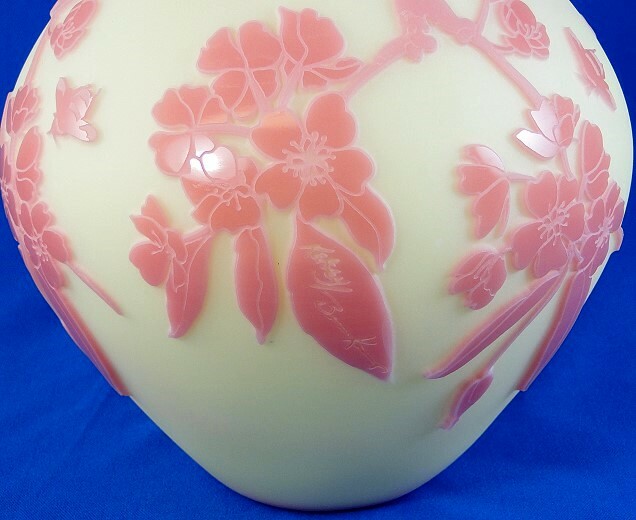 This is one of the most beautiful and exquisite glass items produced by Fenton. Cameo artists Kelsey Murphy and Robert Bomkamp have perfected an advanced vignetting technique for sand carving to achieve both dimension and depth. 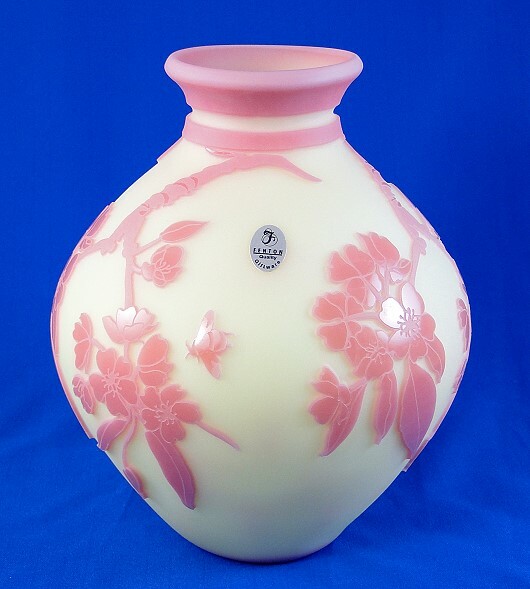 This outstanding vase features an intricate floral design with leaves, and bees. The artists have signed the vase on one of the leaves in the design. 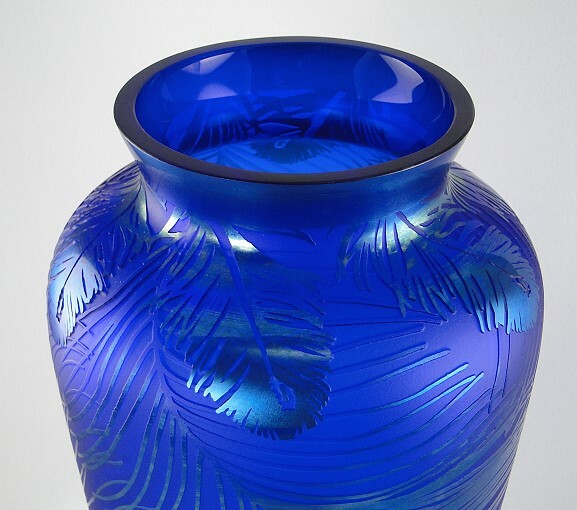 The vivid iridescence of Fenton's Favrene glass makes the intricate details come alive. 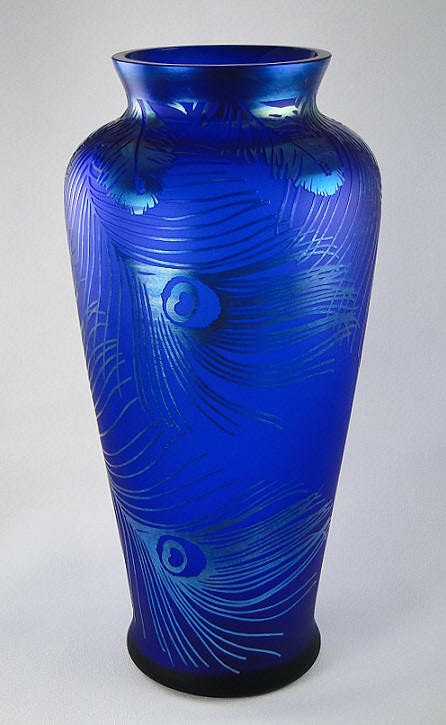 This tall vase in stunning Favrene has a unique design of peacock feathers going around the vase. The sand carving gives the feathers a silvery color along with a slight iridescence. This is a gorgeous vase ... much prettier in person! Vase is hand numbered on the bottom, along with the signatures of the artists, Kelsey Murphy and Bob Bomkamp. Educated at the Rhode Island School of Design, Kelsey Murphy is internationally renowned for her cameo glass creations. Actively developing cameo for more than two decades, her work can be found in the permanent collections of the Corning Museum of Glass and the New Orleans Museum of Art as well as in our nation's White House. She works closely with fellow artist Robert Bomkamp, and Fenton collectors can look forward to seeing some of their efforts in the future. Made with pure gold, Fenton Rosalene glass is always a delight to behold ... but delight is doubled when a piece is done by cameo artist Kelsey Murphy. 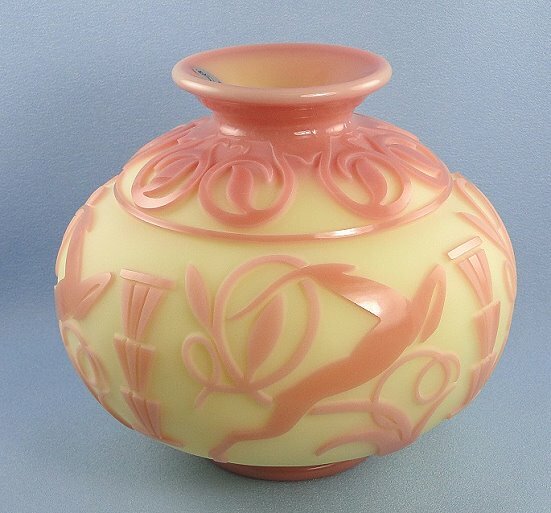 In the 1960s, Frank M. Fenton was inspired to create a new color that was similar to an antique glass known as Pink Slag. Working with Chemist Charley Goe & after much work & experimentation, Rosalene was introduced in 1976. 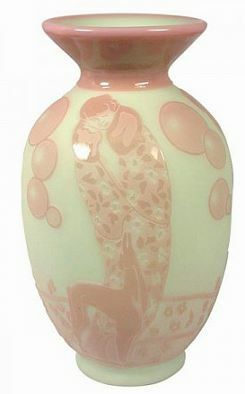 This gorgeous Rosalene Vase features a 1920s style lady walking on a windy day. 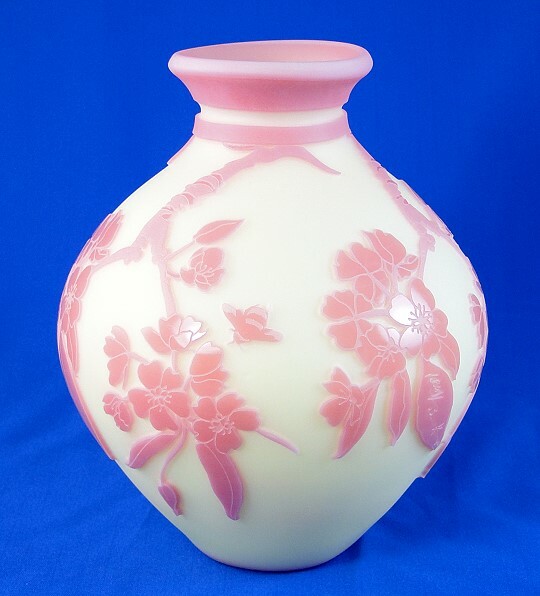 Unlike most Rosalene items produced by Fenton, this Vase has a satin matte finish, with varying shades of pink and white. Made with pure gold, Fenton Blue Burmese glass is always a delight to behold ... but delight is doubled when a piece is done by cameo artist Kelsey Murphy. This gorgeous Blue Burmese Pitcher features a 1920s style lady picking grapes from a grape vine that continues all around the top of the pitcher. The sand-carved design is three-dimensional and is mostly light pink. 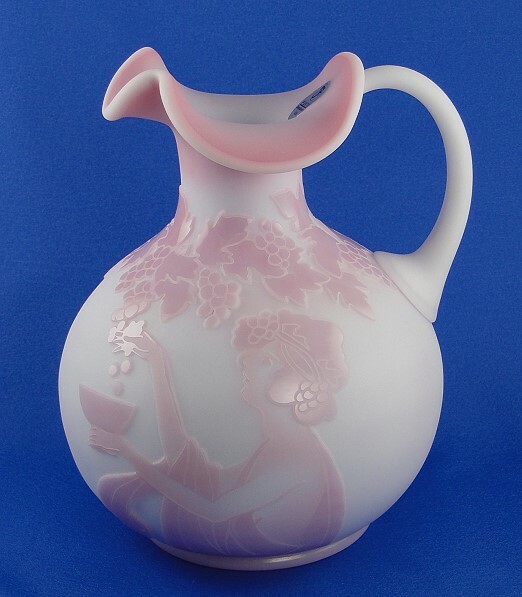 Pink blush also appears in the graceful top of the pitcher, and around the base. Made with pure gold, Fenton Burmese glass is always a delight to behold ... but delight is doubled when a piece is done by cameo artist Kelsey Murphy. This gorgeous Burmese Vase features art deco style deer frolicking around the vase in an elaborate design. The Burmese color is spectacular when done in a Cameo treatment! Made with pure gold, Fenton Lotus Mist Burmese glass is always a delight to behold ... but delight is doubled when a piece is done by cameo artist Kelsey Murphy. 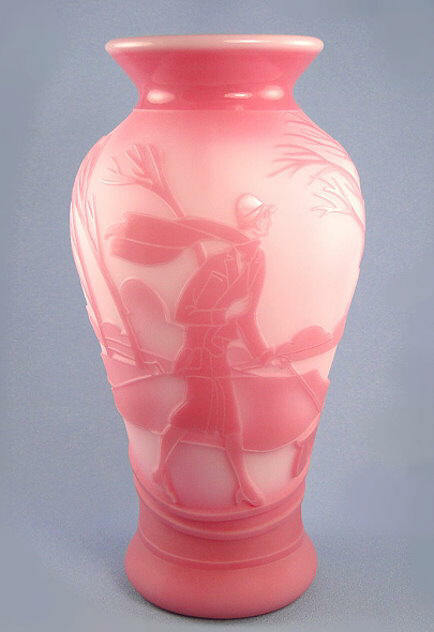 This gorgeous Lotus Mist Burmese Vase features a 1920s-style lady dressed in an elegant coat with her dog. That means Fenton is no longer making that item - we still have it available as long as it appears on our website. We will ship by UPS or Priority Mail, which ever is the more affordable.